One can also use alkaline oxalates. Likewise formic or acetic acid, solid salts are however easy to use. Add a spatula-tipful acetate, formate and oxalic acid to seperate test tubes. Add approx. 1 ml sulphuric acid 10% to each test tube, sway back and forth a bit, the oxalic acid dissolves with difficulty at cold temperatures. From the acetate and formate acetic acid and formic acid are respectively released. Add to each tube a couple of drops of potassium permanganate solution. Heat the solutions until boiling or decolorization occurs, perhaps keep boiling shortly. The formic and oxalic acid solutions are decolorized, the acetic acid solution is not. The diluted solutions can be discharged into the drainage. Formic acid and oxalic acid are oxidized to carbonic acid. Acetic acid is, as is the case with almost all carboxylic acids, not readily oxidized. 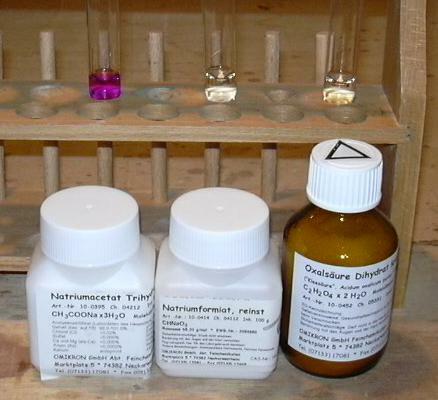 The acetic acid solution remains colored even after boiling, the others are decolorized. Inspired by experiment 1696 S, "Reduktion von Kaliumpermanganat durch Oxalsäure", , as well as theorectical considerations.